Eggs, hard-boiled or, if you want to save them for future useblown eggs. Clear adhesive dots (find these in the scrapbooking aisle of your local craft store). Microfine glitters and/or colored sugars. A pen, pencil or marker. Use your pen or pencil to make marks on the egg where you want your dots to be placed. Place your adhesive dots on the marks, and remember not to place your egg on any surfaces, because the adhesives will stick it a table, plate, towel, etc. 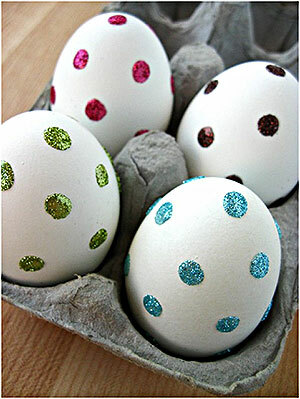 Place a piece of paper under your egg, and sprinkle glitter (or kid-friendly colored sugar) all over it. Brush off the excess with a paintbrush.